Get involved in National Nutrition Month to improve your diet! March is many things to us – the beginning of spring, the time to deep clean the house, and an opportunity to enjoy the lighter and longer days. March is also National Nutrition Month, making it the perfect time for us to re-evaluate what we put on our plates. Many of us will have stuck with our new year’s resolution to eat better, and others will have slipped back into junk foods. Taking charge of your health contributes to overall wellbeing. Since what we eat has a direct correlation to our health and either causing or preventing some of the major chronic illnesses such as heart disease and diabetes, it’s time we get our nutrition back on track. This National Nutrition Month, aim to incorporate these foods into your daily diet. Beans, soybeans, split peas, chickpeas, and lentils are all legumes that are powerhouses of protein and nutrition. They are full of fiber, antioxidants, and help to lower cholesterol. They are so easy to sneak into meals too, whether it’s including beans in a salad or snacking on veggies and hummus. Aim to get at least three servings of this group a day. Just like greens are the healthiest vegetables, berries are the healthiest fruits. Berries are a fantastic source of antioxidants and, when eaten seasonally, are affordable. Berries work wonders for your overall health as well as hair, skin, and nails. Aim to get one generous handful of fresh berries into your diet every day. Such as broccoli, cabbage, collards, and kale. 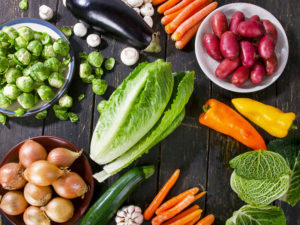 Research from the American Cancer Society has linked a variety of cruciferous vegetables to the reduced risk of colorectal cancers as well as other cancers. Since these vegetables are full of sulfur compounds, they are great at detoxifying cancer-causing compounds in our bodies. Aim to get in at least one serving a day and at least two additional servings of greens a day. Nuts are a great source of heart-healthy unsaturated fats. In fact, adults who consume nuts on a regular basis are more likely to live two years longer than their non-nut-eating counterparts. Aim to incorporate 1 tablespoon of ground flaxseeds into your daily diet, in addition to a serving of nuts or other seeds. In studies, people who ate more than three servings of walnuts per week managed to cut their risk of dying from cancer in half. Vegetables provide plenty of fiber, nutrients, and cancer-fighting compounds. The top cancer-fighting vegetables are cauliflower, Brussel sprouts, green onion, leek, and garlic. Whole grains can be considered as oatmeal, rice, buckwheat, quinoa, pasta, and corn kernels. Oats have been proven to lower cholesterol and blood pressure, making them a great choice for adults looking to reduce these levels. Aim to get at least three servings of whole grains into your daily diet. Eating healthy doesn’t’ have to be hard or boring! Get creative in the kitchen with these groups of food so that you can eat well and feel better.